It’s been a hot few days and nights here in London – weather all too familiar from New York, but not comfortable here in a city that doesn’t really get icey cold air conditioning. A small fan just ain’t cuttin’ it, though the pleasure of a pillow fresh out of the freezer is truly outstanding. So on this hottest day for seven years I decided a brief jaunt to a chilled cinema was in order – to catch The World’s End, finale to Simon Pegg and Edgar Wright’s ‘The Three Flavours Cornetto Trilogy‘ following on from the splendid Shaun of the Dead & Hot Fuzz. An almost eerily empty cineplex seemed very fitting for this sci-fi apocalypse tinged film, though from the very outset the plot felt somewhat less relaxed than Pegg & co’s previous outings. An overly long flashback sets up the premise – Gary King, once the coolest kid in school and now a messed up ex-drug addict, believes his only happiness (and perhaps salvation) rests in successfully repeating a pub crawl that failed 20 odd years before. This pub crawl, taking in the ‘Golden Mile’ of twelves pubs culminating in The World’s End of title fame. To achieve this he gathers his original friends, now all very settled down, and off they go. Of course, this being from the brains that invented the zom-rom-com nothing is quite as it seems. Very quickly the plot transmutes from the simple plays of mid-life reminiscence into a sci-fi romp. Though original in its own concept, the film plays homage to many films (even somehow Lord of the Rings), and part of the fun is recognising the source. Unfortunately these nods seem more like the highlight of this outing rather than an added bonus, as the whole affair felt like a sequence of sketches and visual ideas strung together on a tenuous premise rather than a coherent whole. The World’s End is certainly an enjoyable film, but nowhere near the heights of its stable mates. Perhaps it will turn out to be a grower, fingers crossed! On the plus side – two hours of being in a comfy, air conditioned seat was well worth the £15. Early new years ‘resolution’ time.. I plan to be more rigorous, perhaps annoyingly so, in writing about all the minutiae of what I’m up to. One part of that will be writing brief reviews of everything I watch. So, first on the block – Howl , another movie I picked up on a random night in Fopp. 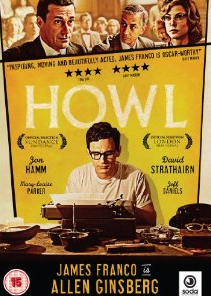 Howl presents a biopic of beat poet Allen Ginsberg, played wonderfully by James Franco, covering his early life, and the attempt to prevent publication of his book ‘Howl and Other Poems’ on the grounds of obscenity. The style of the movie jumps around a lot, moving from scenes of Ginsberg giving an interview, or in his early life, then to the court room, where Ginsberg’s book is defended by Jon Hamm looking dashing as always, interspersed with a strange art school style of animation describing the story of Howl itself. All of this is mildly disorientating and I found myself not really getting a sense of any of the characters as a narrative, though Ginsberg comes across well. Perhaps this is in keeping with the chopped up beat poet style – but then we only see a few dashes of that along the way. Overall worth seeing if you’re fans of Franco or Ginsberg. Or need to have everything Jon Hamm is in of course. came out, and we worried that you could be influenced by Disney into having a movie that seemed more about merchandising than anything else. 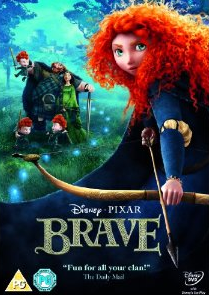 So when the merger happened between Pixar/Disney I had a moment of worry that, although everyone was excited that Pixar would improve Disney, a ‘Disney-fication’ of Pixar might also happen..
, the story of a headstrong, young Scottish princess who rebels against her parents desires to marry her to one of the Princes of the highlands to maintain the shaky peace. Magic is invoked, consequences unintended happen, and the story unfolds with beautiful Pixar animated style and a range of Scots accents. By strange coincidence, I watched Aladdin the other day – a perennial favourite for Robin Williams’ wonderful turn as the genie (and some toe tapping tunes). The story of a Princess not wanting to be married off without love is there in both, though turning it round to have the Princess as the center of the story is a nice change, and Merida – the Scottish Princess – is believable as the rebellious, self-sustaining type. There are also other twists, but that would spoil the plot. The story is not the real hero of this Pixar tale though. The richness of the story seems lacking, with some obvious steps taken and a distinct lack of the layers that keep taking you back to other Pixar movies. This time the magic is in the visuals, from Merida’s stunning auburn locks that almost have a life of their own, to the light changes playing across dramatic Scottish landscapes. The one exception is a common gripe from any 3D movie.. the rotating draw back shots from key locations. Ug. Filmmakers – these do not work out of 3D – the majority of your watchers – and immediately scream ‘movie made for 3D’. Story first, 3D spinning shots second thank you very much. Similarly there are some good characters, but they seem to lack the overall charm (and wit) of other Pixar creations – outside of the main players, who are all enjoyable and engaging and in the case of Merida’s three brothers, welcome comic relief (and cute as three identical buttons). In summary: A beautiful and enjoyable movie, but not one of Pixar’s best. Och aye.